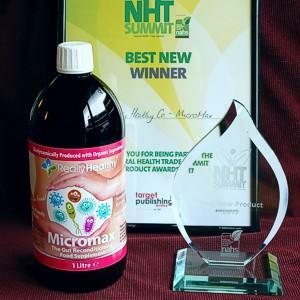 Micromax, our new gut reconditioning supplement, has won BEST NEW PRODUCT at the 2017 Natural Health Grade Summit. Micromax combines the effectivness of microorganisms developed by Professor Tigor with the biodynamic production methods of Rudolf Steiner. The result is a gut formula able to effectively restore flora health and balance. There are up to 80 different microorganism in Micromax and they are produced using up to 40 different wild Alphine herbs in order to grow the most vibrant and hardy microorganisms. This supplement is not a probiotic in the usual sense of the word, but closer to a prebiotic in that it promotes conditions that favour the growth of friendly bacteria. For more info on Micromax, please click here.